I have just finished my third UFO for 2006. I'm doing well, only 37 more to go!! This one is a little ATC size tartan purse or pouch for a Scottish friend, Lorraine. I sewed lots of little scraps of different tartan fabrics to a foundation then embellished them with stitching on the seams, embroidered thistles, White heather and bluebells, using tiny bluebell shaped beads. Because the tartan itself was so busy I only added three charms - all Scottish, then added a black suede backing piece and lined it in tartan taffeta. I bound it in tartan bias-binding and added gold herringbone stitching and a black beaded fringe. Hi Viv, Hope you are feeling better today. 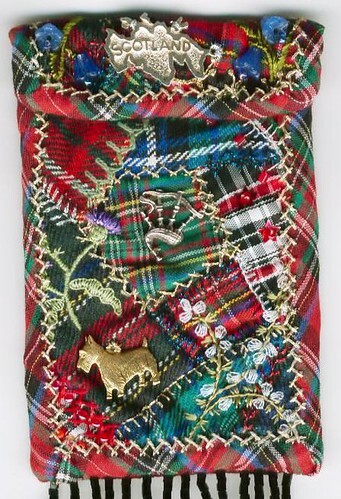 I just love this scottish pouch your friend will surely be delighted. It is just exquisite. 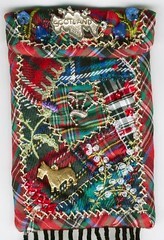 Och aye, I see some Royal Stuart tartan in there... how lovely and creative, Viv! How cool is that! And I love the bagpipe charm...! Oh I do love this, Vivienne! I have some Scottish blood in me somewhere far back I know, and every now and then it calls to me!